Reagent bottle with plastic stopper. 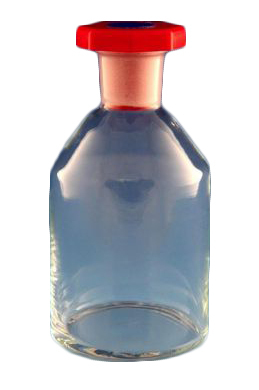 The bottle has a ground glass socket mouth with 24/29 and a red plastic stopper. The bottle is made from soda lime class, not borosilicate, so it should not be heated above 100C or have hot liquid poured into it. Also not suitable for super cold liquids like Nitrogen or dry ice. It looks like an old style medicine bottle so its ideal for Harry Potter or Breaking Bad themed events. This product is made from soda lime glass. Manufactured from standard glass which is cheaper than our borosilicate labware but not very resistant to high temperatures, sudden thermal changes or corrosive chemicals. Do not heat above 100C. Academy is a brand of Smith Scientific Limited who are the leading supplier of glassware, tubing, plastics and ancillary products to the wholesale laboratory, industrial and educational markets. Established in 1922 with a global customer base, our goal is to provide the highest level of service, the broadest selection of products and the most competitive of prices. We hope our dedication to customer service will ensure the continued success of your business, regardless of your size or industry.